“Canaccord Genuity's Tony Dwyer estimates the equity benchmark will end 2017 at 2,340, an increase of 15 per cent from Wednesday's closing level of 2,047.63, with half of the gains coming this year. The strategist expects that an improvement in the global economy and higher commodity prices will boost corporate earnings that have fallen for four straight quarters. The S&P 500 has lost 1.1 per cent since the start of 2015. "The combination of historic monetary accommodation, better economic readings, a positive inflection in EPS beginning 2Q16, and the historic turn in market breadth and credit warrant a more aggressive position," Dwyer, an equity strategist and managing director at Canaccord Genuity, wrote in a client note Thursday. "We believe a more stable global economy, emerging currency and commodity price backdrop should allow for better EPS growth despite the macro headwinds." Result: S&P 500 closed 2017 at 2673.61 up 17.03 %. Commodity prices have risen steadily. Result: Closest and therefore the most optimistic was John Praveen of Prudential at 2575. Everyone else about couple of hundred points short. I’m sure last year I thought this was even ludicrously optimistic. I can’t remember seeing a list like this that could be mic drop worthy like this one. Somebody buy Amit and Mitch a cocktail…and find out what they like for 2018. Well done. 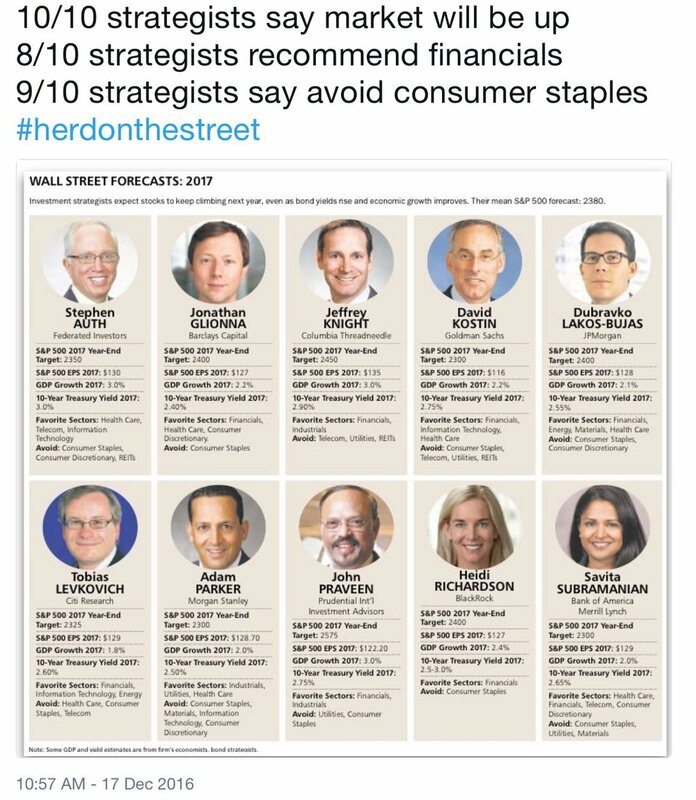 Telsa was a top pick of many market strategists in 2017. “Tesla Motors Inc., fresh from its $2.6 billion merger with solar-power provider SolarCity Corp. in November, was named top stock-market pick for 2017 by Baird Equity Research on Friday, with analyst Ben Kallo forecasting that Tesla Energy and Model 3 production will beat expectations. 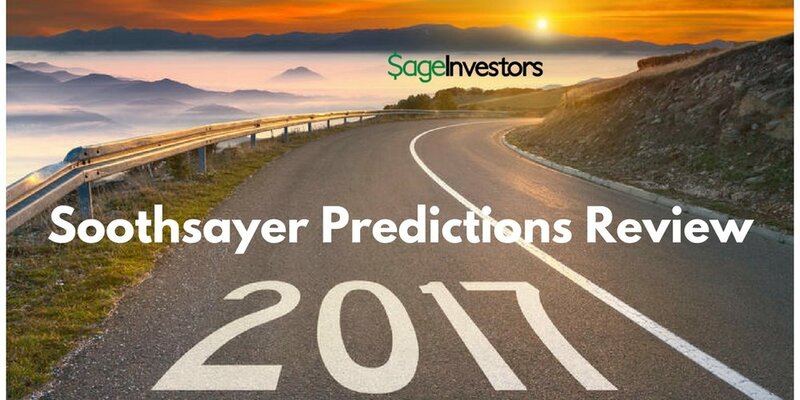 Here's a bunch of ETF's that were predicted to hit it out of the park in 2017. 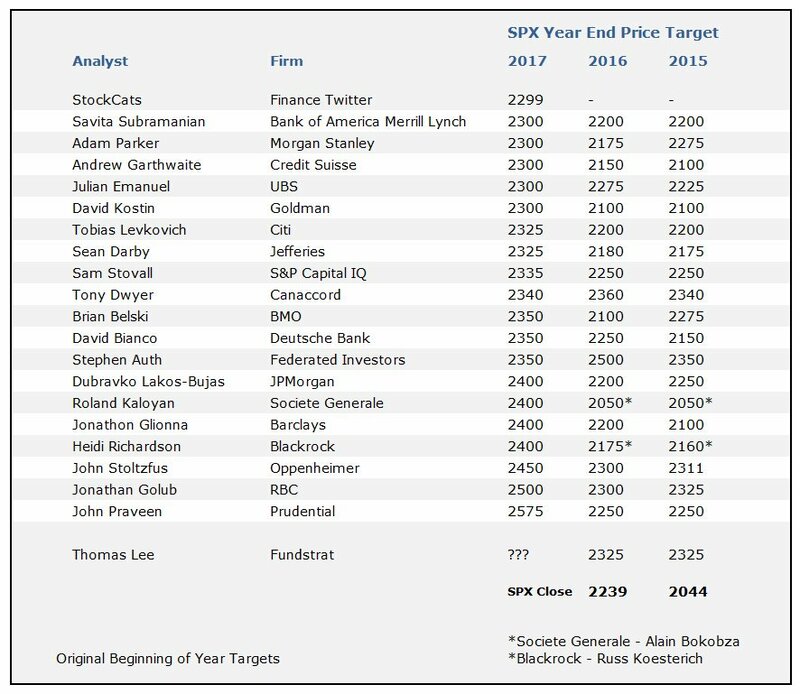 I have been writing these type of review posts for quite a few years now and I can't remember a year like this past year where the predictions of the analysts were pretty good. It's usually quite comedic how way off their predictions are. That being said, credit is due where it is due and so I tip my hat off to them. Well done. They are smart people, no doubt about it, unfortunately, it is just impossible with any level of consistent accuracy to predict the future. I've already been logging the 2018 forecasts so let's see if they can keep the streak up.